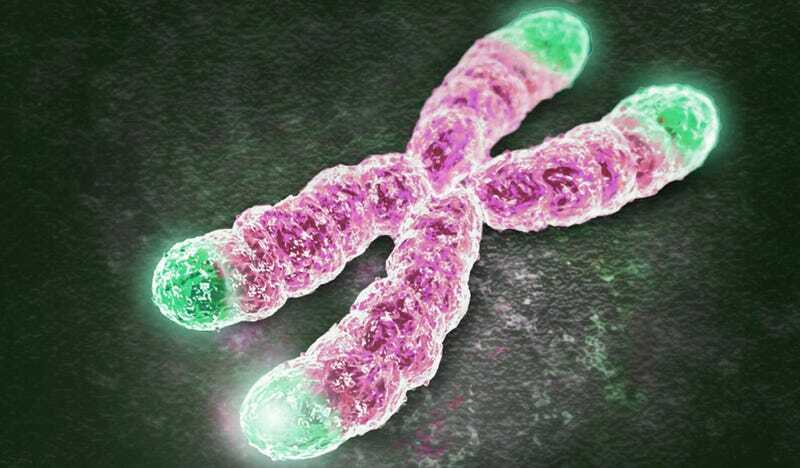 Telomeres are those critical protective caps located on the tips of chromosomes. Think of them as those protective pieces of plastic on the ends of your shoelaces. Without them, the tips basically fall apart, which is kind of what happens with chromosomes over time; human telomeres, which are about 8,000 to 10,000 nucleotides long, get shorter and shorter with each cell division. Over time, they reach a critical length, and the cell stops dividing, or simply dies. At the macroscale, we experience this as senescence, or aging, as your body's cells progressively lose the ability to replenish. So you can see why this breakthrough, in which the Stanford scientists rapidly and efficiently increased the length of human telomeres, is big news. To do it, a research team led by Helen Blau delivered a bioengineered version of messenger RNA that encodes a telomere-extending protein to cultured human cells. In this case, the RNA contained a coding sequence called TERT, which is the active component of telomerase. After this treatment, the cells performed as if they were much younger than the untreated cells; they happily multiplied away instead of degrading or dying as per usual. Overall, the treated cells were able to divide up to 40 more times than untreated cells. "Now we have found a way to lengthen human telomeres by as much as 1,000 nucleotides, turning back the internal clock in these cells by the equivalent of many years of human life," noted Blau in a release. "This greatly increases the number of cells available for studies such as drug testing or disease modeling." The 1,000 nucleotide addition represents a 10% increase in the length of the telomeres. The new technique has been applied to such cell types as fibroblasts (common cells of connective tissue) and myoblasts (cells that give rise to muscle cells), and is currently being tested on stem cells. ...tapping the gas pedal in one of a fleet of cars coasting slowly to a stop. The car with the extra surge of energy will go farther than its peers, but it will still come to an eventual halt when its forward momentum is spent. On a biological level, this means the treated cells don't go on to divide indefinitely, which would make them too dangerous to use as a potential therapy in humans because of the risk of cancer. Indeed, increased telomerase activity in humans has been linked to cancer. Clearly, there will be limits to how this new biotechnology can be used to combat various aging-related diseases. That said, this breakthrough holds a lot of promise. The new approach could introduce entirely new ways of preventing and treating diseases of aging, including diabetes and heart disease. It could also be used to treat genetic diseases associated with telomere shortening, including Duchenne muscular dystrophy. "This study is a first step toward the development of telomere extension to improve cell therapies and to possibly treat disorders of accelerated aging in humans," added study co-author and Stanford cardiologist John Cooke. Looking ahead, the researchers are hoping to understand more about the differences among cell types, and how they can overcome those differences when applying their new technique. "It might not be the Fountain of Youth to keep us young forever, but this discovery is a real shot in the arm. This work is a game-changer," noted Gerald Weissmann, the Editor-in-Chief of The FASEB Journal, in a press release. "In the short term it will help us to understand how aging affects the molecular machinery of cells. In the long-term, the sky's the limit. Biologists have long guessed that the key to a longer lifespan is figuring out how to extend telomeres. Helen Blau and her colleagues have just done that." Read the entire study at The FASEB Journal: "Transient delivery of modified mRNA encoding TERT rapidly extends telomeres in human cells". Supplementary information via Stanford. Top image: Chromosome with telomeres highlighted in green. Courtesy of Dr Joseph Raffaele, co-founder of PhysioAge Medical Group.